Welcome to the MC Job Hub! We connect experienced consultants – masters in analytics, modeling, strategy and presentations – to incredible career opportunities. And the best news yet? At least for now, membership is entirely FREE! To apply to become a member of our exclusive community, complete the form below. Once your application is submitted, we will review your credentials and notify you of your placement in one of our 3 tiers: Genius, Gold or General. 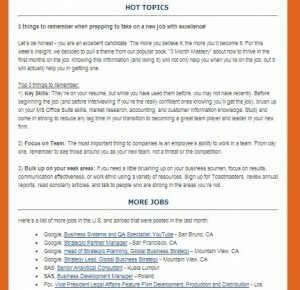 Your tier will determine which job opportunities will be sent to you in regular Job Hub Buzz emails. Your submission will be kept entirely private, visible only to MC staff, and our decision on your tier is final unless your work experience changes. Please note – a current LinkedIn profile is required for admission to any tier of our prestigious community, so please ensure you take the time to refresh your LinkedIn experience and provide an accurate personalized public URL. As a member of the Job Hub, you will receive periodic e-mails that will include information on our featured firm that month, tips for sealing a job, and tons of links to current job openings suitable to your skill set. 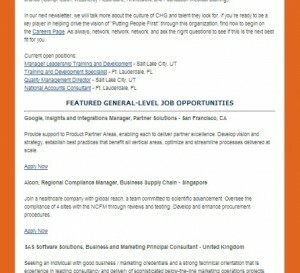 We look forward to welcoming you as a member of the MC Job Hub!